Krautreporter is a news service, run by journalists in Berlin. More than 12,000 subscribers pay a minimum of 5 Euros a month to get daily updates on the news and well-researched long-reads. Just like newspapers used to do. Wir drucken Krautreporter from erik spiekermann on Vimeo. Once we had finished restoring our Johannisberger stop-cylinder press from 1924, we were looking for projects to test the machine. When I suggested to the friends at Krautreporter that perhaps we could print one special issue, they immediately went for that crazy idea. We had already built our laser-setter and were able to make metal-backed plates up to 52 by 72 cm (approx 20×28in) directly from data, without going through photographic negatives. 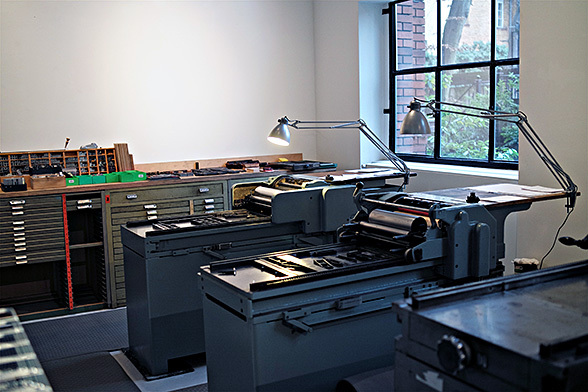 These plates fit our Heidelberg Cylinder press where we can print 8-up, i.e. 8 book-size pages on one plate. For the newspaper, however, we wanted to print the classic Nordic format, 44×57cm. 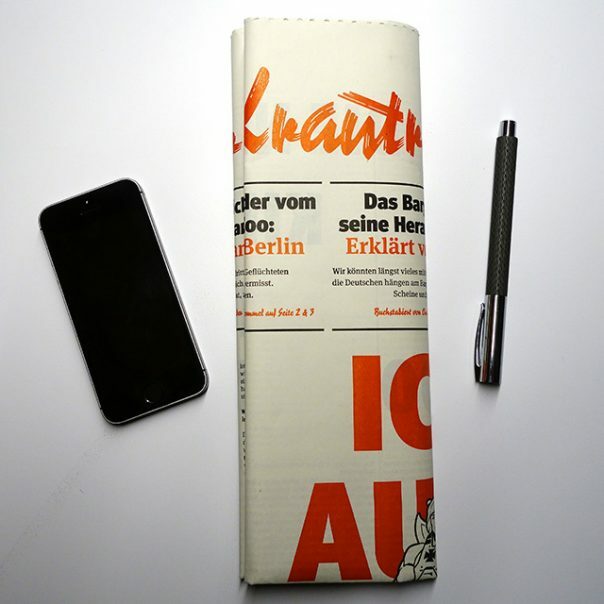 In Germany we still have a few daily papers which are printed that size, the FAZ – Frankfurter Allgemeine Zeitung – being the most prestigious one. Making four aluminium bases to get the thin plates to the height of metal type (23.56mm = 0.928in) was an adventure in itself. All the other things we didn’t know about this large press took us five months to figure out, but eventually we started to print. We had enough paper (60gsm newsprint) to print 6000 copies, 8 pages, all on one sheet, back and front, 88×114cm plus some trim. One side black only, the other black and red. 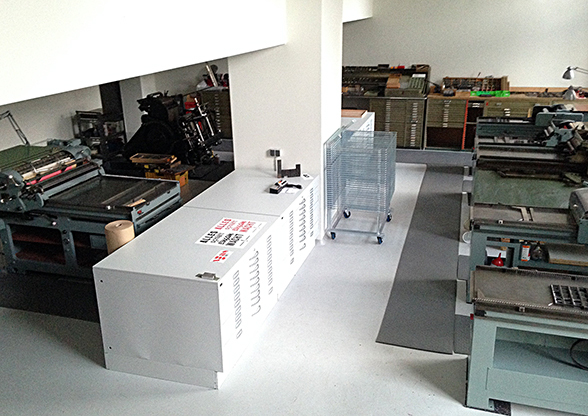 18,000 prints altogether, at a speed of not much more than 300 an hour, with 2 people at the press at all times. We ended up with almost 5000 good copies. The sheet was perforated in half inside the press but not separated. We wanted the readers to get the full effect – the exact opposite of a smartphone screen. For the mailing we folded the large sheet into a narrow strip with a label around it. The movie shows our own Daniel Klotz at the press. His buddy Sebastian came to help whenever he could. Daniel spent more than half a year figuring out how to make everything work. Now we know why printers used to go through a three-year apprenticeship. 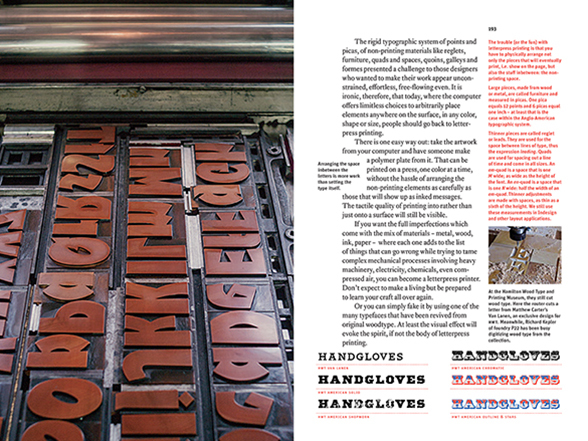 That press wasn’t made to print from polymer plates, and it still holds a few secrets. But we have our proof of concept, a full-size newspaper. It is so popular with Krautreporter subscribers that we may have to print more issues. 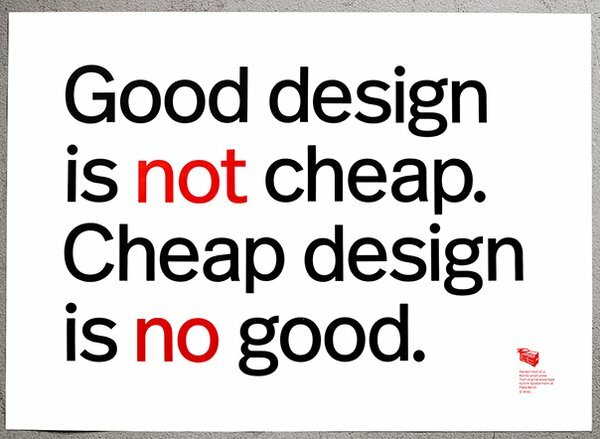 No idea where this line comes from; I’ve heard it often, not necessarily with “Design” as the keyword. After 50 years in the business, I can guarantee that it is entirely true. We set the words from our brand new Real wood type (based on FF Real), 20cicero tall, cut for us by Tudor Petrescu in Romania. Tudor is busy right now, cutting a smaller size of 12 cicero in Real Regular as well as in Real Demi. As always, the poster is printed on MetaPaper Rough Warm White 160 gsm in Black and Pantone Warm Red ink. From original wood and metal type on our Korrex Frankfurt, 50×70 cm. 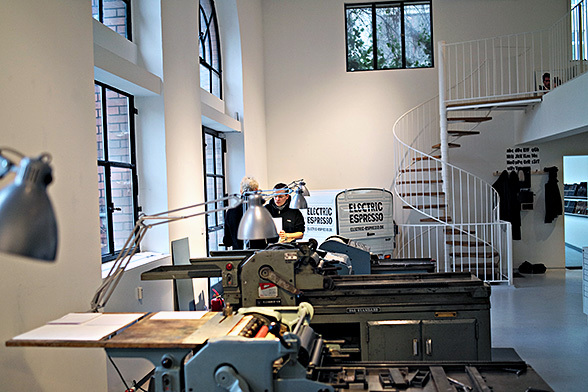 The 50 posters each are num­bered and signed by Erik Spiek­er­mann. We ship every­where and you can pay by Pay­Pal. Price is the same in these cur­rencies: £, $, €; always 98, includ­ing tax (where applic­a­ble) and ship­ping, wrapped in a solid card­board tube. Please go to spiekerstuff to order. You can also check out the other prints there as well as the metal housenumbers I designed a few years ago. Some of them are still available from spiekerstuff. 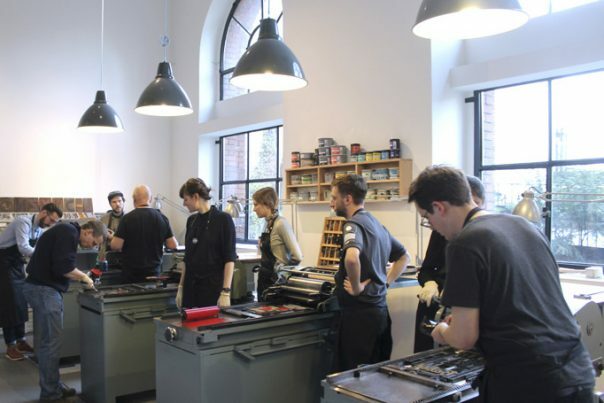 One of the joys of running a letterpress studio is to share the experience with others. 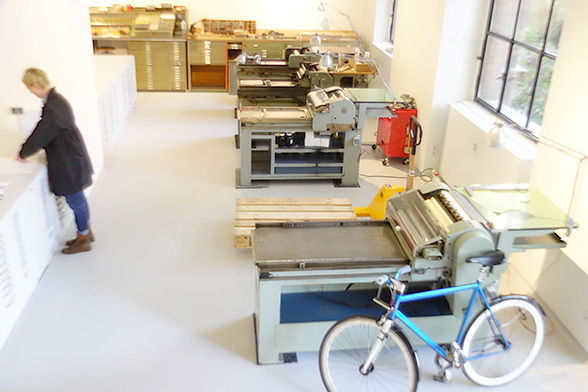 At galerie p98a we regularly set up workshop sessions for a group of individuals or an entire team. We’ve had design teams here for a team-building exercise, for a day of reprieve from sitting in front of their screens or simply for the fun of getting their hands dirty. You’ll find a list of planned workshops on spiekerstuff. That page links to Eventbrite, from where you can reserve a workshop and find out about the financials. Our workshop at Galerie P98a in Berlin has been producing posters for a while now, plus other stuff. In our cellar, we also keep some of my older products, like the metal house numbers I designed for Design Within Reach in San Francisco a few years ago. On p98a we now have a shopping cart installed that makes buying posters or house numbers painless – apart from having to pay for them, of course. We’ll also eventually post our workshops on Spiekerstuff. November poster hot off the press! 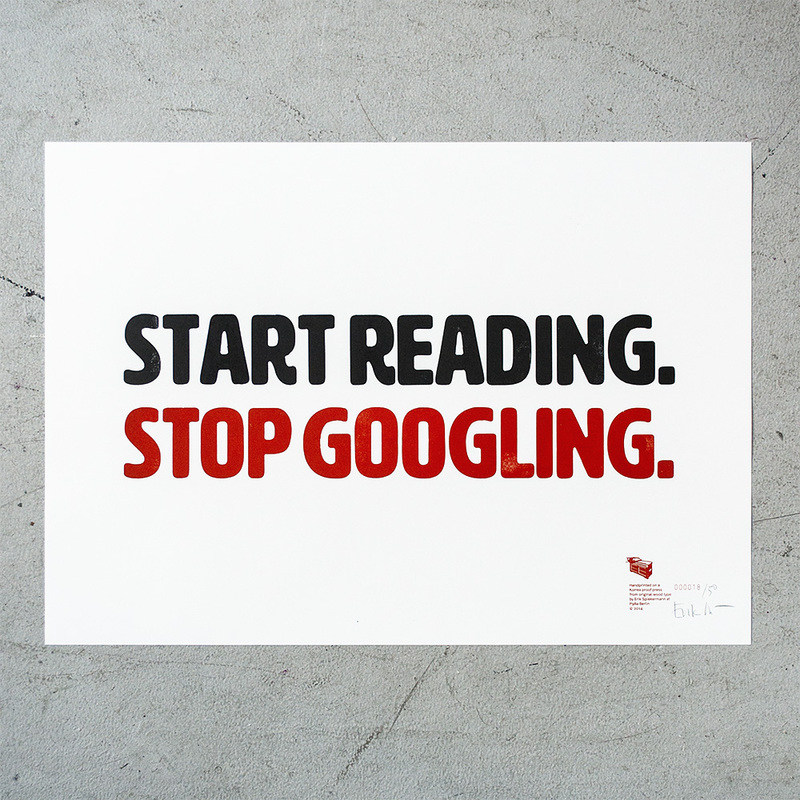 This month’s poster is, as always, 50×70cm in size (approx 20×28in), printed 2 colours on 150gsm Meta­Pa­per Rough. The type is 16 cicero (approx 17 pica) HWT Artz, the one I designed for the Hamilton Wood Type Museum to cut in wood for us. 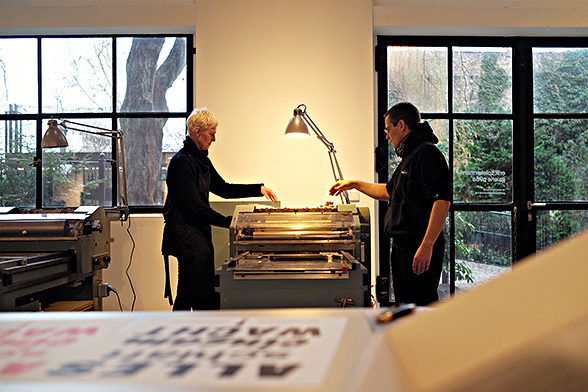 There are 50 prints of each poster, num­bered and signed by Erik Spiek­er­mann. We ship every­where and you can pay by Pay­Pal. Price is the same in every cur­rency, £, $, €: always 98, includ­ing tax (where applic­a­ble) and ship­ping, wrapped in a solid card­board tube. Orders with shipping address please to info@p98a.com. 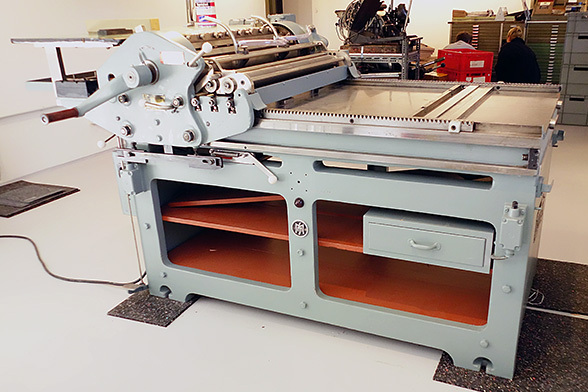 We now have two FAG proof presses, one Grafix, a Korrex Berlin, a Korrex Nürnberg, a Korrex Frankfurt and a Heidelberger Tiegel (platen). We won’t even mention all the small platens in the shop. 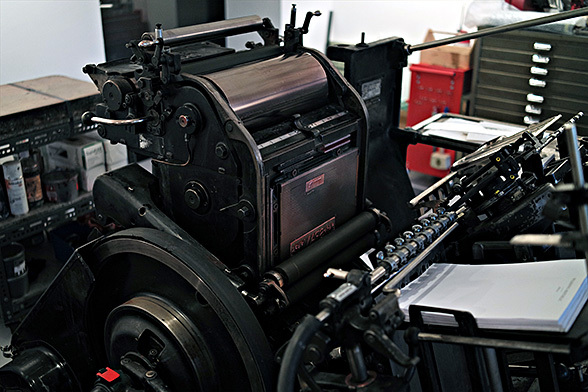 And as off last week, all the presses are up and running, although the latest FAG needs cleaning up and repainting. On top of that a surprising amount of large display type, made from wood or Plakadur, Berthold’s resin material from the 50s. And lots of lead type, old and new, including freshly cast Akzidenz Grotesk and Block in sizes from 8 to 24 point Didot. Reglet, quads and furniture, iron and aluminium, are waiting to be sorted. A second row of cabinets is on order. 1 Korrex Nürnberg 35×58, 1 Korrex Berlin 50×65, 1 Korrex Frankfurt 61×86, 1 FAG 35×58, 1 Grafix 35×58 and one more FAG coming next week. 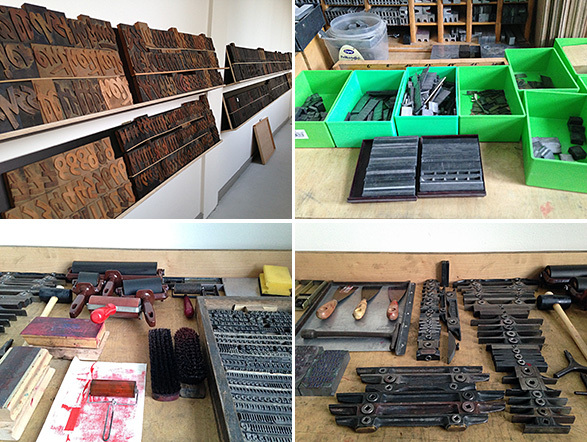 The Heidelberg Windmill is waiting to be put together and all the type needs sorting. Ready to go any day now. The big Korrex is all electric. It makes noises like a battleship in action. Discussing the quality of type on a smartphone screen is difficult without the actual object at hand. I posted screenshots, but they were reduced, changed in resolution, uploaded and rendered in a browser. Far removed from the real thing. 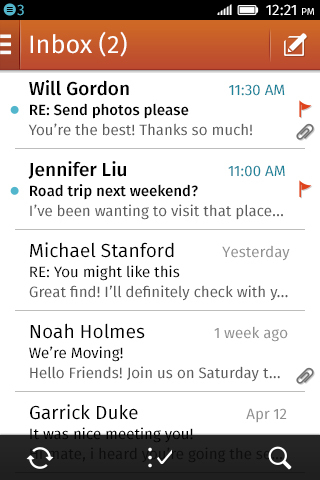 Then again, if our typeface survives this, it’ll be well suited for even modest resolution on a small screen. The original screenshot is 320x480px at 165ppi.